The one question you need to ask to test your customer experience. The wall of shame for the retail experience. The best and worst of shopping at retail stores. Retail trends for 2018 that you can’t afford to miss. This week we dig into Jeanne Bliss’ book, Would You Do That to Your Mother?, to take a closer look at how this simple question can be a great test for your customer experience. We hear from Jeanne herself about how you can simplify your customer experience transformation and culture transformation by getting personal with how you think about them. Give Would You Do That to Your Mother? a look because it’s a fantastic guide for how to test your customer experience. Share, trust each other, play nice in the sandbox, and treat others how you want to be treated— your mother’s advice still applies to how to behave in business. We’re back on the Twitter train, but this time Joey’s along for the ride. We look at the greatest hits of #retailfail, which allows pretty much anyone to document something embarrassing by taking a picture and using the hashtag. We discuss how you can avoid ending up on the wall of shame. Have someone look at your displays who isn’t setting them up to test your customer experience before your customers do. All experiences can come online very easily. Focus on making so many remarkable experiences that are shared publicly that people will give you a break if you make a silly mistake. While we’re on the theme of retail, we give it the Love It / Can’t Stand It treatment. We talk about how valuable human interactions are in the experience, how layouts and displays can contribute to that, and go over the good, the bad, and the ugly. We also hear from our listeners via the handy-dandy SpeakPipe widget at the bottom of this page. Your employees make the difference in the in-store customer experience. Lay out your store to help your customers, not play mind games with them. Don’t miss the “6 Hot Retail Trends in 2018” article on SmarterCX.com. The whole piece is worth a read, but the trends you should pay attention to are voice assistance, artificial intelligence, seamless customer journeys, payment processing, differentiated experiences, and augmented reality. Get to SmarterCX.com to keep up on the latest trends and test your customer experience against them. Dan: Get ready for another episode of the Experience This Show. Joey: Join us as we discuss doing unto others as you would do unto your mother. How Twitter chronicles companies customer experience fails, and what we love and can't stand about shopping at retail stores. Dan: Mothers, failures and retailers, oh my. Joey: We're excited to give you an overview of an important book you should know about, as well as share some of our favorite passages as part of our next Book Report. Dan: I am so excited to discuss a brand new book by Jeanne Bliss, one of the true pioneers in the customer experience field. In fact, she has led customer experience for five major US corporations. Starting with Lands' End under the tutelage of founder, Gary Comer, Mazda North America, Coldwell Banker, Allstate and Microsoft, before she founded her own practice called Customer Bliss in 2002. She's also the co-founder of the CXPA, or Customer Experience Professionals Association. Her new book is called Would You Do That to Your Mother? Which, if I must say, is the best title I have heard for a business book in quite a long time. Let's hear directly from Jeanne about her new book. Jeanne Bliss: Hi, this is Jeanne Bliss, talking about my upcoming book called Would You Do That to Your Mother? The Make Mom Proud Standard for How to Treat Your Customers. This book is about simplifying your customer experience transformation and culture transformation by creating a way to think about and get personal with our customer and employee experiences. We have created a world where customer experience is important, but we've over complicated it. What I wanted to do, after 35 years of helping our industry, is create a shorthand guide that's simple, that's easy, that's consumable, and that helps you. 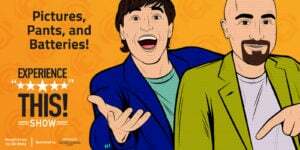 This book turns 32 case studies into 32 mini toolkits that you can use immediately without a lot of money to change your culture, to improve things for both your customers, your employees, and your mom. The four main chapters are called, Be the Person I Raised You to Be. This first chapter is about enabling employees to bring the best version of themselves to work. The next chapter is called, Don't Make Me Feed You Soap, which is about getting rid of the things that make it hard to be a customer, and about celebrating those companies who are doing that. The next chapter is called, Put Others Before Yourself, which is about redesigning the business to improve customer's goals. Start with their life, improve their life, and grow in that manner. Then the final chapter is called, Take the High Road, getting rid of those practices like gotcha moments and fees, where you can get a little bit of money out of a customer's pocket, but you're not going to earn the long term relationship. The final chapter in the book is called, Stop the Shenanigans, which is your mom lens quiz to determine where you are in building a company to make mom proud. Dan: Joey, I loved the concept of using good old mom as the filter for customer experience. I think it's really relatable, and it's a great way to put yourself in customer's shoes and really to look at mom as sort of that person that you never want to let down. I thought that even though we talk about trying to imagine what your customer's thinking quite a bit, I thought this concept of specifically thinking about mom was a new take on it. I thought it was really effective. What did you think? Joey: I totally agree with you Dan. I think it's one of those things where when, as customer experience leaders we try to instill in our employees and our teams and our colleagues the importance of paying attention to customer experience, it's nice to have a common thread or a common reference point. While certainly everyone's relationship with their mother is unique, if we were to pick one category of relationship, everyone at some point had a mother, so we at least know. It's kind of different than saying, “Well, think about how you take care of your children.” Something like that. Additionally, what it does is for the most part it creates this standard of, to your point, we don't want to disappoint mom. We want to do a good job. We want to behave well and behave in the way we were raised, type thing. I think it's a really good model. I also really liked the 32 real life case studies that Jeanne used in the book. This is a method that I used in my book, and I'm a big believer in, and I know you used in yours. I think it's a great way to impart kind of customer experience advice, or words of wisdom, or best practices, by couching it in a story that's a lot easier for folks to remember. Two particularly stuck out to me. One which is just up the roads, of Vail Resorts, the ski resort based here in Colorado, although they have mountains all over, banned the three words, our policy is. By banning those three words, they freed up their employees to use their best judgment in delivering guests the experience of a lifetime. An employee didn't need to worry about getting caught up in the rules and regulations of, well our policy is blah, blah, blah. Instead, they could just focus on being human beings. I also loved, loved the example from Virgin Hotels, which was named the number one US hotel by Condé Nast Reader's Choice Awards. The cool thing about Virgin Hotels is they changed their pricing for their in room mini bars to be the equivalent of what you would pay if you actually exited the hotel and went to the convenience store on the corner. To be completely frank Dan, as someone who has pulled that exact move, of being in the hotel, looking and seeing the $17 jar of gummy bears, and thinking, if I go downstairs to that 7-11 I passed on the way into the hotel, I can get a bag of gummy bears that is even bigger than the jar they're selling at me, for one-third or one-quarter the price, and walked down and done just that. I love that she features Virgin Hotels, and what Virgin Hotels has done around this. Just to be reasonable. 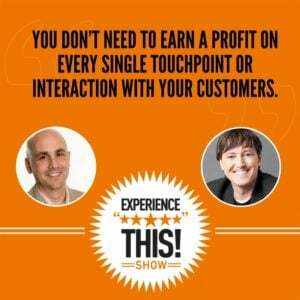 You don't need, as an organization, to earn a profit on every single touchpoint and interaction with your customers. Dan: Yeah. I love case studies as well. I think that they serve the additional purpose of not making the whole book sound like you're getting a lecture from the author, but instead the author is sharing stories from how other companies are doing this well. That really means that the other companies are teaching you in addition to the professor who wrote the book. I liked that as well. Let's hear from Jeanne again, as she reads to us her favorite passage from the book. Jeanne Bliss: Would you turn down your mom's warranty claim three days out of warranty? No. You'd want to hear her story. You'd want to know her customer history. If you're on the front line, you'd want to be given the chance to make an informed decision. You'd want the company to honor your decision, because you had gathered more facts to guide the outcome than could be covered by a blanket policy. You'd want your decision honored based on the values, empathy, and ability you were hired for. When we are validated, and even the slightest concession is made to accommodate us as customers, it makes a difference, and that difference contributes to how we stack up the companies we will go back to and talk about. This is not a plea to throw company profits out the door by loosening every rule willy-nilly. It's about preparing employees. It is about enabling employees to act in situations where valued customers are at risk. It's about letting them make the call to let a few hours slide off a car rental because they have a high value customer in front of them, or honoring that warranty claim for your mom three days out of warranty because it's the right thing to do. Let policy and the golden rule collide. As we become increasingly self-sufficient in almost every part of our lives as customers, it becomes even more urgent that when someone connects with the humans of your company, the contact is meaningful. The authenticity of these connections, people's ability to really help, and the front line's respect for the customer, because they themselves are respected, are now more critical than ever. Doing human interactions well in an increasingly self-service world will set you apart. Joey: The example of the warrant that Jeanne refers to, I feel is spot on. You know, when you think about your mother needing to wait on hold, or deal with rude employees, or get hit with some arcane, inflexible policy, it really helps to, I think, bring to the focus this idea that we need to just be a little more reasonable in how we interact with our customers. To kind of continue the trend that Jeanne is outlining in her book to say, how would we want our mother to be treated? If we're not treating our customers the way we'd like our mother to be treated, we should adjust how we approach our customers. She refers to that idea of be the person I raised you to be. I think that's good advice, not only for how we should behave as organizations, but how we should behave as customers as well. Giving people the benefit of the doubt, and hopefully operating in an environment and in a system where the organization or the business will do the same for us. Dan: Yeah, I agree. I also in addition like the part that she mentioned about focusing on the right thing to do. I think that's also a very easy filter, because it lands you in the answer that is fair, that is ethical, that is the right thing to do. Obviously we all grow up with slightly different morals and values, but I think if you use a simple filter like that, you're generally going to make good decisions for your customers. As usual, Joey and I have also picked out our favorite quotes from the book. Joey, why don't you start us off? Joey: This was a short one, but I felt it was a very powerful sentence in the book. The quote was, “A graceful departure may lead to an eventual return.” In this section of the book, Jeanne goes on to ask, “Would you change your mom a penalty for canceling her subscription with you?” She asks readers to think about the last personal breakup, or breakup in a personal relationship they had, and notes that if it went well, there was an opportunity to remain friends. I thought this was spot on. Lots of times when a customer leaves we naturally feel some frustration. We feel let down, sometimes might even feel betrayed, feel left behind. We don't need to pour gasoline on an otherwise bad situation and make it worse. Sometimes the way we exit a customer, or we end a relationship with a customer, actually not only creates opportunity for additional customers to come our way because of the story that that customer tells, but it may even be the case that the customer comes back to us. I know we did an episode, back in episode 17 we talked about Chewy.com and what they did in kind of ending a relationship with a customer. This idea of not burning bridges I think is an important and valuable one. Much like in relationships kids, you don't have to be enemies with the person that you used to tell that you loved. You can try to be a grown up and say, “All right, well let's see if we can at least remain friends, or at least be cordial to each other, even though the relationship may have shifted." Dan: Well, my favorite quote was also short. In fact, it was even shorter than yours. Joey: Oh it's a contest to see who can have the shortest quote, eh? Dan: Yes. I can name that quote in four words. Joey: I can name that quote in three. Joey: I'm sure we'll talk about it again. Dan: We may. Specifically about the jargon that they use. She happened to point out words like formulary, adjudication and coinsurance. I think this is absolutely true. This idea of write like you talk. Nobody uses those words when they talk if they are not in the health insurance industry. If you write like you talk, which is something I've always tried to do. I think if you look at my book or blog posts, you're going to see very few SAT words in there, because I'm not trying to impress anyone with my vocabulary. Frankly my vocabulary isn't that good, but I always use simple words because that's what people understand. Joey: Fair enough. I think instead of our typical key takeaways, what we should do is throw it back one more time to Jeanne for a bonus passage from the book that I think really sums up nicely the entire message and the key takeaways from the book. Before we do, folks, go out and purchase a copy of Would You Do that to Your Mother? 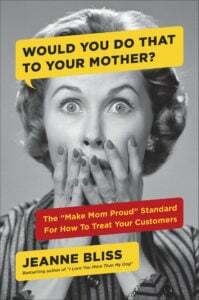 The Make Mom Proud Standard for How to Treat Your Customers, by Jeanne Bliss. You will not be disappointed. She's a friend of ours. She's a friend of the show. Separate from that, she has put together a fantastic book that we know you're going to love. Head to your local bookseller, get on Amazon, check your local indie bookstore, track it down. Would You Do That to Your Mother? By Jeanne Bliss. You will enjoy this book. Take it away Jeanne. Jeanne Bliss: Our childhood, mom's lessons and our business life. They share freely. They have our back. They are there in good times and bad. They always have our best interest in mind. They are brave. This describes our moms. It also describes companies that follow her lead on how they grow their businesses. The lessons we learned as kids stick with us, and often they have our mom's face all over them. Her guidance, her rules and her sayings are still in our heads. You probably grew up that way too, with a simple, clear understanding of what to do and what not to do. We were taught to share, trust each other, play nice in the sandbox, and treat others like we'd want to be treated. These lessons remain some of the best advice we've ever been given. They also remain some of our most sound advice for how to behave in business. Companies that make mom proud grow by living those lessons. They remove practices that might curb the extension of care, or limit employees to act in good conscience. They work to remove boundaries and pressures that prohibit customer driven decision making, and they challenge leaders to walk away from practices that aren't congruent with their values. Their actions honor the human at the end of the decisions, establish a balanced relationship with customers and partners, and put employees in positions to act at work like they'd act at home, like they were raised. Dan: Today we get to talk about one of Joey's favorite topics, Twitter. Joey: Oh man, seriously? Come on Dan, come on. Dan: Actually I think you're going to like this one Joey. Joey: All right, all right. I'll bear with you. Dan: I was recently made aware of a hashtag on Twitter called #RetailFail, in which customers share their bad experiences with retailers around the world. There's actually also a Twitter account which is @_RetailFail, and that account appears to have one purpose, which is to retweet all of these posts to 11,000 plus followers. There are some really funny examples when you just do a search on Twitter for #RetailFail. I wanted to share some of those, and then we can also talk a little bit about the fact that this even exists is pretty interesting to me. A couple weeks ago was Easter, and there happened to be a couple of them that were pretty funny related to Easter. One of the reasons we're going to talk about Easter, even though it's several weeks past, is that one of the things that Twitter does when you look for a search is it defaults to the top performing tweets. Even a few weeks after the holiday, these are still at the top, and I think that's really important for brands to know when they are either talking about or being talked about on a particular holiday. One chocolate company built a big display with Peter Rabbit on it for Easter, and the steel bar that holds the product is coming out of an unfortunate place on Peter's body. Of course, what did a customer do? Take a picture and #RetailFail. Another store was a bookstore that had a sign that said, “Easter, what we recommend.” That was right above a display of 50 Shades Darker books. These are the kind of things that you see on #RetailFail. Have you checked this out Joey? Joey: I have not, but we may have identified the thing that will make me go to Twitter. This may be the tipping point ladies and gentlemen, of what will make me be a more active Twitter user, if only to follow the @_RetailFail Twitter account and chase down the #RetailFail postings. I think this is hysterical. It falls into that beautiful category of truth is stranger than fiction. The number of things that are happening all day, every day, out and about in the world that are just, if you're willing to look at it with a sense of humor, will just leave you on the floor rolling laughing, I think is absolutely incredible. I am very much intrigued, to say the least. Dan: Well, there's also a really important point here, which I talk about a lot, which is that offline experiences can come online very, very easily, just with somebody having a camera in hand, which we all do. The reason why we're talking about this stuff today, even though it's really funny and entertaining, is because you've got to be careful with this stuff, because anything can end up on Twitter with the #RetailFail, which can be sort of an embarrassment. Here's a couple more. We don't like to embarrass brands specifically on this show. There's lots of other people that do that, and so I'm going to exclude the names here, but you can certainly go onto Twitter and probably find them. Somebody tweeted a picture of their wooden floor, and it said, “This is the empty spot where my 81 year old mom's sofa was supposed to be delivered on Saturday. Seven hours on hold with customer service and still no sofa. #RetailFail.” Then there was somebody who posted a mother's day, a sign in a retail store that said, “Mother's Day.” Right over a display of household cleaners. Dan: There's another sign that said, “Bananas.” Under a whole bunch of apples. You know, really nice. Then here was one for a major retailer that frankly often gets great grades for experience. “That feeling when you order online at blank, and they send you the wrong item twice, and finally have the right item, but will charge you $75 more than what you paid for. And then say, 'Oh, we made a mistake, but if you want it, you have to pay the new price.' #RetailFail.” Even the best companies, the ones that are held out in high standard, can call victim to this. Finally, there was a picture of a grocery store sign that unfortunately messed up what meant to be fresh duck eggs. I'll leave it to your imagination Joey, but it was really only one important letter that they messed up. Joey: Oh gee. That's bad. You know, and I know Dan that you love highlighting signs, and how signs really act as the face of the brand. You refer to a number of great ones in your book. I know a couple weeks ago, in episode 30, we talked about the grammar vigilante of Bristol, the fellow who goes around fixing mistakes on businesses' signs. I think the crazy thing about this is, and I don't know if you've ever worked in retail Dan. I have, and what I think is interesting about this is every employee who is working in the store should take the time to actually look at the displays that are in the store. Because I have to believe that some of these displays, especially the ones referencing signage, that it doesn't take a high level of awareness, or even frankly literacy, to be able to look at this and say, “You know what? We should have done something differently.” Folks, there are solutions out there. Pay attention so that you don't have to be in a situation where you see your brand featured on #RetailFail. A couple key takeaways here. Number one, have someone look at all these signs and displays, preferably not the person setting them up, before the customer sees them. This is kind of the way, when you write something you should have someone else with fresh eyes edit it. Same goes for retail. When you set something up, have someone with fresh eyes look it over. Number two, remember that all experiences, offline or online, can come online very easily. Ask yourself whether you'd be happy seeing the experience you're providing in a photo or Twitter, similar to that consideration of, would you do this to your mother? That we talked about in the last segment, but would you be excited to see yourself featured on #RetailFail? Probably not. Finally, number three, focus on making so many remarkable experiences that are shared publicly, and then people will probably give you a break if you make a silly mistake and just not really hold it against you. Good luck not being part of the #RetailFail. Sometimes the customer experience is amazing, and sometimes we just want to cry. Get ready for the rollercoaster ride in this edition of I Love It, I can't Stand It. Dan: I thought we'd follow up that last segment about #RetailFail by playing my favorite game, I Love It, and I Can't Stand It. Let's keep with that theme of retail by talking about experiences shopping in retail stores, shall we? Joey, why don't you start us off with one thing that you love about going shopping? Joey: All right, well I love friendly staff. The benefit of not being online is that you get to interact with a human, and I love it when that human is friendly. Dan: I love when it's easy in, easy out. I don't like trying on clothes, and so I want in, into the changing room, out, and as quickly as possible. Joey: Nice. Along those same lines, I like a neatly organized store with easy to find items, and the right sizes that are also in logical locations. The day of hiding the thing I really want in the back of the store, stop doing that folks. I know it makes me walk through the store, but it also insults both of our intelligence. Dan: I also love loyalty programs. I'm a sucker for them. I like the benefits, I like the coupons. It's kind of like why we're loyal to an airline or a hotel, because we like the points. I also really like that in the retail environment, and will often show up just because of a great coupon. Joey: Nice. I particularly like it when they show you how all the items can go together. For example, in a clothing setting, on a mannequin. I actually consider myself fortunate that I'm one of those folks who can kind of envision what things look like, even without needing to see it laid out perfectly. Even still, I sometimes like it when stores do that, because it creates the opportunity for kind of a little less mental work on my part, to try to imagine what the pants, with the shirt, with the sweater, with the shoes, would actually look like. Dan: I'm the guy that says, “Honey, do these things match?” I can relate to that one very much. I will also admit, and I don't know, like Joey, you and I might deviate here, but I always love the clearance rack. I find some of the best bargains there, and I'm always so excited when I find something that I actually like over at the 70% off section, because I know why they're there, it's usually because no one else likes them. When I can find something that is my size that I like, that is a win/win for me. Joey: Nice. I will agree with you and take it one step further. Just go straight to the outlet store, that is a favorite move of mine, because everything is on the, it's the clearance entire store, not just the clearance rack. Joey: Let's talk about some things that we can't stand, and I'll kick this one off. It drives me bonkers when the salesperson is in your pocket the second you cross the threshold of the store. “Hi, welcome to our store. What can I help you find today? What are you looking for today? Let me introduce [blah 00:27:02].” I'm like, whoa, whoa, whoa, let me even, let me just ease into this a little bit. I see that there's no one else in the store. I will come to you if I need help. Ease up a little bit on the attack, salespeople. Dan: Definitely agree on that one. I try to weave my way in and out of the store to avoid the salespeople. I also can't stand when things are hard to find. I'm thinking here of like walking into a home improvement store, and it's gigantic, and there's no one there to help, and the overhead signage doesn't make any sense, and all I want is something really little, like a box of nails, which could be absolutely anywhere in this 45,000 square foot store. That is one of the things that drives me nuts. Joey: I absolutely hear you on that one. One thing that happened recently for me. I found myself in, and I'm not going to name the brand, but I will just say in a bookstore. I found myself frustrated that the bookstore wouldn't acknowledge the fact that their competition was Amazon. In this day and age, that's what you're competing against. You're competing against the ease of use for me to go on Amazon and search, the ability to find exactly what I'm looking for, the ability to throw it in my cart in an efficient, effective way, at a low price. I actually asked if this bookstore would be willing to match the price on Amazon, and the person actually laughed at me. They were like, “Ha ha. No.” I thought, all right, well now I understand why more people shop on Amazon than at many retail locations. Dan: Well yeah, if you're not going to match the lower price, you better be providing a better experience, and some people say, “Well, I like to go to the bookstore to hold the book and smell the book and feel the book.” That is part of it, but if you can't find the book, or if there's other problems with the experience, it's not worth it. Dan: I mentioned this actually a little in the first one by accident, but I can't stand when there's no one there to help. I understand that hiring staff is expensive, it's a big line item for retail stores. If you're going to put a store there and not have anybody there to help, it does create a very frustrating experience. I've walked out of stores before because there's just simply nobody there to help me, and I feel like if they're not willing to help, they probably don't want my business badly enough. Joey: I am frustrated when it feels like a game of Where's Waldo, when I'm looking for the price tag. Where it's kind of a trick to see, can you find the one item out of the 17 we have grouped together here that we actually decided to put the price tag on? The rest don't have the price tag, go on a little scavenger hunt and see what you can find. Folks, make it easy. I'm going to find out what the price is when I get to the cash register, and if I'm not happy with it, I'm going to have wasted all that time, and I'm going to leave you to re-shelve the item, and restock the item. Put the prices where it's easy and clear to see. Dan: You know, I once asked for the manager of the produce section at my local grocery store, because there were so many items that didn't have any prices. I called him over and I'm like, “Do you expect anyone to buy these peaches when they have no idea how much they cost? It could be 99 cents a pound or 5.99 a pound." It wasn't just one item, it was multiple items, so I was beside myself. I also complained at the same store about my last can't stand, which is long checkout lines. Stores should have the technology available to them today to predict when there's going to be long checkout lines, and to make sure that they have enough people working. I would say not only are grocery stores definitely guilty of this, but so are the warehouse clubs very much so. You go in on a Saturday or Sunday, you can't get out of those places. Joey: You're a fool, if you choose to go to a warehouse place on the weekend, you are pretty much signing your own sentence, that you might as well just find yourself in the prison that is the big box warehouse store. Dan: Just pitch a tent. Joey: Exactly. Camp out folks, we're going to be here awhile. Dan: All right, so one thing that Joey and I are always excited to do is hear from listeners about what they love and can't stand about shopping, or whatever topic it is we're talking about. Today we'd like to hear from three of our awesome listeners about what they love and can't stand about shopping in retail stores. Sarah: Hi, my name is Sarah. One thing I love about shopping in a retail store is being able to try clothes on. One thing I can't stand about shopping in a retail store is that they don't always have my size. Speaker 5: Hi, my name is Caroline. One thing I love about shopping at a retail store is getting help from an employee on putting a complete outfit together, because I don't always know what goes together. One thing I can't stand about shopping at a retail store are long lines and bad return policies. Sarah2: Hi, my name is Sarah. One thing I love about shopping at a retail store is when I bring my item up to the counter and it's at a discount and I didn't know. One thing I hate, or one thing I can't stand about shopping at a retail store, is when the salespeople are on commission. Dan: Thanks to our listeners again for sharing with us what they love and can't stand. You can do that too, here's how. You can go to our website at www.ExperienceThisShow.com. Go to any episode, scroll down to the bottom and you'll see our speak pipe widget, which is basically online voicemail. You can record a quick message to us about what you love or can't stand about any particular topic. One that we've talked about before on this show, or one that you'd like us to talk about. While you're at it, feel free to give us some ideas, or tell us about experiences that you've had that you'd like us to talk about here on the show. We love hearing from you. Joey: It's tricky folks. It's tricky. Dan: I know. We try to make things difficult on this show. Dan: As always, you can go to Twitter and find me @DGingiss, that's D-G-I-N-G-I-S-S, or you can go to my pal and friend, and not quite as excited Twitter user as I am, but he's there folks, @TheJoeyColeman. Remember the The, otherwise you're going to get some other Joey Coleman who does not cohost the Experience This Show. Dan: Okay Joey, this week's number is six. What do you think it means? Joey: I'm going to guess that you're referring to the Shortstop, Dan. Dan: Wait a minute, did Joey Coleman just make a baseball reference? Joey: Why yes I did. I've been brushing up on my baseball trivia so that I can connect with you more Dan. Dan: I love it. Number six on the baseball diamond, the shortstop. You are correct, except that's not what I was referring to. Actually I was referring to Six Hot Retail Trends in 2018, which is an article that I was just reading on SmarterCX.com, the website that is hosted by our friends and sponsors at Oracle CX. The six hot retail trends are voice assistance, artificial intelligence, seamless customer journeys, payment processing, differentiated experiences, and augmented reality. Joey: Oh, I like all of these, but you know the one I think offers the most potential is the seamless customer journey. It requires a fair amount of work, but if you can pull this off, boy you have raving customers, raving fans. They will love you, love you, love you if they feel like they can navigate between channels and still get a great experience. Dan: For the full article, Six Hot Retail Trends in 2018, and more great content, go to SmarterCX.com/ExperienceThis. You will get new content, the ability to sign up for the Oracle CX newsletter, and lots of great stuff, even summaries of some of our favorite Experience This episodes. Check it out, SmarterCX.com/ExperienceThis.